Martha Hatch (1774-1843), married Edward Climpson. Martha was William and Martha’s firstborn. She (‘Martha the daughter of William and Martha Hatch’) was baptised at Beaconsfield Old Meeting House on 8 February 1774 and was admitted as a member of Amersham Lower Meeeting House in 1793. On 31 August 1798 she married Edward Climpson in Amersham by licence. Martha and Edward lived in Amersham town. Edward Climpson is listed in Pigot’s Directories of 1823 and 1830 as a chairmaker and ironmonger in Whielden Street, and his daughters Sarah and Ann were born in this street (1808 and 1814 respectively). In 1842 ‘Climpson and Son’ were listed with a chairmaking premises in High Street and an ironmongers in Whielden Street. In the 1841 census Martha and Edward and their children are shown as living in Whielden Street, but the 1854 Kelly’s directory shows ‘Edward Climpson, ironmonger, chairmaker and corn dealer’ in High Street. None of the children of Martha and Edward Climpson married. The births of Sarah and Ann in Whielden Street are recorded in Dr Williams’ Nonconformist Birth Index. Sarah was admitted as a member of Amersham Lower Meeting House in 1821 and William and Ann in 1831. In 1841 the children were living with their parents (Edward Climpson listed as an ironmonger) in Whielden Street. In 1851, after the death of their parents, Sarah and Ann were listed as living in the High Street, south side, immediately to the east of its junction with Whielden Street. They had two servants living with them, one with a child. Their brother William had taken over as ironmonger. In 1861, Sarah and Ann were listed as ironmongers (‘partners’), William having died. They were again living in Whielden Street (at this time called ‘Union Street’ following the building of the Poor Law Union workhouse). Living with them was 19 year old Joseph Hatch, described as ‘stepson’, but in fact their first-cousin-once-removed. He was also described as an ironmonger and was later to take over the business (see below). In the 1869 Kelly’s Directory, Sarah and Ann were described as ironmongers in the High Street, but by the time of the 1871 census they had retired (Joseph Hatch had taken over the ironmongery) and were living on the north side of the High Street, with one servant. By 1881 Ann had died, and Sarah (described as an ‘owner of properties’) was still living in the High Street, with two servants. The census enumerator’s return makes it possible to locate her residence as the fourth house to the east of the Elephant and Castle. Joseph Hatch born c1841, died after 1891. Little is known of Joseph’s father William except his baptism at Amersham Lower Meeting House and the fact that in 1851 he was living with his wife Juliana and daughter Emma in Chalfont St Peter, and was a ‘mealman’.According to the 1851 census, Joseph was born in Chalfont St Peter, but by that date he was living with his grandparents Joseph and Elizabeth in Amersham High Street. By 1861 he had moved to live with Sarah and Ann Climpson in Whielden Street where he was evidently helping as an ironmonger and was regarded as their stepson. By 1871 he had married Margaret (born in Blisworth, Northamptonshire) and had taken over the ironmongery which was listed as being in Whielden Street, though Kelly’s Directory of 1877 lists it as being in the High Street. Joseph and Margaret had a servant living with them. Joseph continued the nonconformist tradition and was listed as a trustee of the Lower Meeting House. By 1881 Joseph (39, ironmonger) and Margaret (36) had three children – Joseph Climpson (named after his distant cousins) age 9, Edward age 7 and Margaret age 4, all born in Amersham. They are listed as living in Whielden Street (east side) at its junction with High Street. In 1891 Joseph and Margaret were still there, Joseph still an ironmonger, with a 6 year old daughter Sarah Ellen, born in Amersham. Joseph Climpson, Edward and Margaret were not present.By 1901 this branch of the Hatch family had all moved away from Buckinghamshire. The premises was still an ironmongery (see note on location below) and occupied by William Readhead. Location of the Ironmongery. Various census returns and trade directories give a confusing picture as to the precise location of the ironmongery and the place of residence of the Climpsons and Joseph Hatch. Trade directories for 1823 and 1830 have Edward Climpson’s premises in Whielden Street; the 1842 directory shows the Climpsons having an ironmongery in Whielden Street and a chair-making establishment on the High Street. From 1854 until 1891 the location of the premises is given as High Street. Census returns show the family apparently moving between Whielden Street and High Street – Whielden Street in 1841, High Street in 1851, Whielden Street in 1861 and 1871. The 1881 census shows the Mead family (grocers) on the High Street with the Hatch family on Whielden Street. The 1891 census shows both families being on the High Street, but with the Hatch family being next to the Redrups who occupied the barber’s premises on Whielden Street. However, photographs taken in the 1880s show the sign ‘Meads’ on the Whielden Street side, so the location is still uncertain. Susannah Hatch (born 1780, died after 1851), married John Chapman. Susannah ‘the daughter of William and Martha Hatch’ was baptised at Beaconsfield Old Meeting house on 18 September 1780 and married John Chapman in Amersham by licence on 30 May 1814. John Chapman was listed as a Trustee of Amersham Lower Meeting House where he was described as a ‘dealer in butter’, and in the 1830 Pigot’s Directory as a poulterer and butter dealer in Bury End. No record of them has so far been found in the 1841 census, but they had five children – William, Martha, Sarah, James and Elizabeth. William was born in Amersham on 3 June 1815, but no further trace of him has yet been found. Martha was born in Amersham on 8 September 1816 and was mentioned in Joseph Hatch’s will as having married Miss Andrews, but no further trace of her has been found. James was born in Amersham on 4 July 1820 and was buried in May 1832. Elizabeth was born in Amersham on 4 October 1822 and remained unmarried, living in 1851 with her mother Susannah in the household of her married sister Sarah. By 1851 Susannah (who had been bequeathed £2 in her father’s will) was living as a widow with Elizabeth (unmarried) and Sarah, now married to Joseph Halt and grandchildren at Woodside. Sarah and Joseph Halt. Joseph Halt is listed in the 1841 census as a ‘butter factor’ living at Bury End, Amersham. By 1851 he and Sarah had with them at ‘Woodside’ two children, Fanny aged 8 (‘scholar’) and Sarah aged 4. By 1861 Joseph and Sarah were listed again at Bury End, Joseph still described as a butter factor, (born in Seer Green) and with children Annie 16, Emma 10 and Minnie 2. Sarah’s sister Elizabeth was still living with them, but her mother Martha had evidently died. Joseph Halt expanded his business interests from butter factoring to operating as a carrier: in 1847 he was operating a carrier service to Berkhamsted via Chesham every Wednesday, and to Windsor every Monday and Thursday. By 1869 he had an additional route to Aylesbury every Wednesday and Saturday, but by 1883 had ceased to carry to Berkhamsted, and the service to Windsor was run in partnership with a Mr Sladen. By 1887 the carrier service was entirely in the hands of Mr Sladen. By 1881 Joseph and Sarah had moved with their daughters Sarah and Emma to Amersham High Street, about five properties to the west of The Eagle beerhouse. Joseph was described as a retired provision merchant. The Halt family appear again in 1891: Joseph and Sarah living with unmarried daughters Annie and Minnie, in Amersham High Street about four properties to the west of The Eagle. The minutes of Amersham Lower Meeting House record the death of Joseph Halt in 1897. Joseph Hatch (1782-1864) married Elizabeth Potter (circa 1781-1854). Joseph ‘the son of William and Martha Hatch’ was baptised at Beaconsfield Old Meeting House on 28 February 1782 and married Elizabeth in Amersham by licence on 30 March 1813, both ‘of this parish’. The Posse Comitatus of 1798 lists a Joseph Hatch as a carpenter’s apprentice in Amersham, and he is described as a carpenter in the 1823 Pigot’s Directory. The 1841 census lists Joseph as a carpenter, living with Elizabeth on the south side of Amersham High Street. He is listed in the Register of Electors in the 1830s and 1840s. He was listed as a carpenter and builder in the 1842 and 1847 Kelly’s Directories, the latter being his last entry. He became a man of property: the 1826 Land Tax Assessment assesses Joseph Hatch at £1 -2s -2d. The listing attached to the 1841 Tithe Map shows ‘yard, school and cottages’ in the High Street owned by a Joseph Hatch (occupied by John Weller, Samson Toovey, Charles Hatch, John Toovey, William Andrew and James Rumsey: this is probably the ‘Hatches Yard’ mentioned in the 1851 census), and further along, ‘house, yard, garden’ owned by Joseph Hatch and occupied by himself, Joseph Rayner, Jane Peevor and Julia Winkworth. Hatches Yard was a row of poor cottages behind and at right-angles to the old Post Office on the north side of the High Street. They were demolished in 1875 and replaced by a row of almshouses built by Harriet Day. In the 1851 census there were 30 people living in Hatches Yard, far more than later occupied the almshouses, an indication of the slum nature of the Yard. An old deed probably refers to a property in Hatches Yard: ‘An agreement made Sept 29th 1858 between Josh (sic) Hatch and Mr Tho Knight both of Amersham. Josh Hatch agrees to let Mr Y Knight who agrees to take from Sept 29th 1858 the dwelling house and garden next to the Gateway in High St Amersham. Rent sixteen pounds per annum including fixtures and the rent payable half yearly to commence Sept 29th 1858 the tenant to pay all rates. The tenant to have the use of the Yard for drying clothes but no pigs to be kept in the yard. The tenant to keep and leave the premises in as good a state of repairs as they are now in. (Signed) William Hatch (sic) Thomas Knight’. William probably died in 1861. In 1881 his widow Juliana, a 64 year old annuitant was living in the household of her son-in-law John St G Baskin at The Kilne, Amersham (a farmer of 162.5 acres employing 6 men and 3 boys), and daughter Emma and granddaughter Catherine age 3. Jacob Hatch 1794-1862, married (1) Rebecca Dorrell 1790-1853, (2) Ann Potter 1791-1884. Jacob was born at Bowers Farm on 2 February 1794 and this was recorded at Amersham Lower Meeting House. He had moved to Chalfont St Giles by 1827 as he was described as bachelor of that parish when he married Rebecca Dorrell by licence on 22 November 1827 in Amersham. Rebecca was ‘of Amersham parish’. He was admitted as member of Amersham Lower Meeting House in 1839 , even though he was resident at Grove Farm , Chalfont St Giles in 1841. In the 1847 Kelly’s Directory he is listed as ‘Jacob Hatch Esq. (gentry) at Amersham Common, and the 1851 census identifies this as Bendrose Farm, Woodside, Amersham, where his holding was 176 acres. He had three labourers living in, one of whom was 17 year-old George Ayres, born in Penn. George was the brother of my paternal great-grandfather Thomas Ayres. In the 1854 Kelly’s Directory Jacob was described as ‘farmer, Bendrose’. Bendrose Farm was located about half a mile east from where Black Horse Bridge now stands, a few hundred yards south of the road from Amersham to Rickmansworth, one of a series of farms built round the perimeter of Amersham Common. The 1870s 6” Ordnance Survey map shows it as being one of a series of farms lying to the south of the road, each surrounded by orchards. The map shows a group of buildings grouped round a central yard, the largest of which, presumably the farmhouse, being on the eastern side. The farm was purchased by the Radiochemical Centre (now GE Healthcare) sometime after the second world war, and has been allowed to fall into ruin. The ruins of the barns remained in 2000, but on the eastern side of the yard, probably where the farmhouse stood, is a modern breeze-block stable. The original approach to the farm led straight from the main road to the yard, but the approach has now been diverted to avoid a large residence which has the name ‘Bendrose’ . To the south of the farmyard is a 20th century building which now bears the name ‘Bendrose Farm’. Rebecca died on 31 December 1853. Sometime after this Jacob gave up the farm and moved to Amersham High Street as a corn dealer. He died on 8 September 1862 aged 63, only a year after marrying his second wife Ann Potter. Both Jacob and Rebecca are buried in the cemetery of Amersham Lower Meeting House, and the inscription on their gravestone was just legible when visited in the year 2000. Unfortunately the headstone of their grave no longer stands by their remains: sometime in the 1970s or 1980s most of the headstones in the graveyard were moved to one corner where they were laid horizontally. Jacob and Rebecca had two known daughters, both of whom took their mother’s maiden name as a second name – Sarah Dorrell Hatch (1832-1910) and Betsy Dorrell Hatch (1834-1837). They were born in Amersham in the house of James Dorrell, and it would seem that Jacob was still living in Chalfont St Giles at the time. There was another, possibly two children, who died in infancy, as a Baptist Chapel (ie Amersham Lower Meeting House) monumental inscription refers to ‘two infant daughters of Jacob and Rebeka Hatch’, but no dates are given. Sarah Dorrell Hatch had an illegitimate child, Sophia, on 7 December 1850 by an unknown partner. In 1851 Sarah aged 18 was living with her maternal aunt Elizabeth Dorrell and with her daughter Sophia aged 4 months in Amersham High Street. Both Sarah and Sophia were described as ‘farmer’s daughters’ They were located on the north side of the High Street, to the west of the junction with Church Street, about the fourth property to the east of the old Red Lion. David Hatch, son of Daniel and grandson of William and Martha, set up the chair workshop (with mechanisation later to become a factory) at Whielden Gate (in 1851 called Hollandsdean) sometime between 1841 and 1851. All his male children were to become chairmakers, but the factory passed to his third son Joseph sometime between 1871 and 1881, then to Joseph’s son, Joseph David, sometime after the First World War. The business (‘J Hatch and Sons’) was sold to the Dunmore brothers around the start of the Second World War, and the premises were destroyed by fire in the 1950s. The site of the chair factory is now the picnic area to the left of the lane to Winchmore Hill just after the turn-off from the Amersham – High Wycombe Road. David Hatch 1815-1885, married (1838) Elizabeth East born circa 1812, died after 1881. David’s birth in Amersham town on 18 May 1815 was recorded at Amersham Lower Meeting House and in Dr Williams’ Nonconformist Birth Index. His wife Elizabeth was born in High Wycombe. David and Elizabeth were married at Crendon Lane Chapel (Independent Congregational), Crendon Lane, High Wycombe on 6 August 1838. The marriage certificate shows David as a chair maker ‘from’ Wycombe Marsh (given as Elizabeth’s place of residence), and that his father was (had been?) a harness maker. In 1841 they were living in Woodrow with their 3 year old daughter Elizabeth, and the census enumerator’s listing indicates this might have been in Cherry Lane. At this time David was a chair maker, the first member of the Hatch family to be thus called. In 1845 David was left £100 in the will of his uncle, John Hatch). It is a matter of conjecture that this newly found wealth enabled him to move to ‘Hollandsdean’ at Whielden Gate and to set up a chair-making workshop there, where he was listed in the 1851 census. A study by John Chenevix-Trench of 17th century buildings in Coleshill indentifies a building called Hollandsdean standing in two acres, occupying the exact site on which the chair factory later stood. The name Hollandsdean pre-dates the 17th century house – it was a field name as early as the 14th century and a detached part of the manor of Coleshill, separated from it by ‘Tomlins’ and ‘Woodrow’ manor holdings. From 1640 the people who paid Hollandean’s quit rent to the manor of Coleshill were landowners in Woodrow.It is probable that David Hatch moved into the existing house rather than building a new one. The author’s aunt Elsie Stubbings (b 1904) née Hatch, on the back of a photograph of the factory, wrote a note to the effect that she could just remember the ruins of a house in the factory yard. Hollandsdean stood at the edge the still unenclosed Wycombe Heath and close to the Queens Head public house and the old Toll house built in 1769 when the road from Amersham to High Wycombe was turnpiked. The frequent incidence of the proximity of chair workshops to public houses has been noted. David Hatch’s enterprise evidently prospered – by 1861 he was described as a chair-maker and employed three apprentices. At this time David’s eldest son John was a ‘journeyman’, presumably working at the premises. His sons George, Joseph and William were all still living there and described as ‘scholars’. His daughter Harriet was not recorded and has yet to be traced, but his eldest daughter Elizabeth was a servant in Amersham (see below). By 1871 David was still at Whielden Gate (‘Whielden Lane’ according to the census) and he and his sons, all living in the same premises were chair-makers. The last mention of David as a chair-maker was in the 1877 Kelly’s Directory: by 1881 the running of the enterprise seems to have passed to his third son Joseph. David died of Bright’s Disease on 2 December 1885 the place of death was given as Winchmore Hill. There is no record of any probate being granted – either his assets were small or he had passed them on before his death. It is a matter of conjecture why the chair-making business should have passed to his third son Joseph rather than to John or George. Joseph Hatch 1849-1943, married circa 1871 Hannah Taylor 1852-1906. Joseph was almost certainly born at Hollandsdean. His birth certificate shows the place of birth on 3 December 1849 as Coleshill, Herts , and the 1851 census shows a one year old Joseph living at Hollandsdean. (The parish location of the chair factory at Hollandsdean/Whielden gate varies from census to census, sometimes Amersham, sometimes Coleshill: in fact the boundary between the two parishes ran straight through the middle of the site of the house and factory ) In 1861 he was still there as a scholar, and again still there in 1871 where he was a ‘chairmaker’ presumably working with his father David. Joseph must have married shortly after the 1871 census, assuming that his first son William was conceived in wedlock. The author’s mother can remember him telling of how he used to walk to Chalfont to court her – presumably across the fields via Coleshill to join the road that cuts through Hodgmoore Wood. The Taylor family lived in or near Three Households. By 1881 Joseph had probably taken over the running of the chair factory, as he was living there with Hannah and their children, while his parents David and Elizabeth had moved to live with their daughter and son-in-law Harriet and George Wilkins. His first listing as a chair manufacturer in Kelly’s Directory was in 1887. In 1891 the family are listed as living in the Penn parish part of Winchmore Hill , and Joseph is described as ‘Farmer and Chairmaker’, indicating that he had taken up farming before his later move to Woodrow Farm. From the dates and places of birth of his daughters Elizabeth and Edith it is possible to deduce that the family moved to Winchmore Hill around 1883. From the census enumeration the family appeared to be living opposite the Potters Arms, near Winchmore Hill Farm. 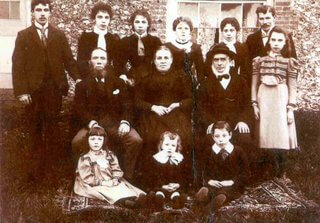 By 1894 Joseph had moved with his family to Woodrow Farm to become a tenant farmer on the Shardeloes estate. He is listed as living there in Kelly’s Directories of 1903, 1907 , and 1915. Sometime between 1913 and 1920 Joseph moved to Childs Farm in Woodrow, a few hundred yards from Woodrow Farm – he was listed there in Kelly’s 1920 Directory: his last listing at Childs Farm was in 1935. In 1938 he moved to ‘Leylands’ , Holmer Green Road, Hazlemere, with his unmarried daughter Henrietta who looked after him in his declining years. By this time he had probably passed the chair factory on to his sons Joseph David and Frederick. His will states that he was at the home of his son Archer in Woodrow when he died on 20 November 1943 . He is buried in Penn Street churchyard: the inscription on the gravestone is no longer legible. Joseph Hatch’s properties. As Joseph prospered, he accumulated property in Winchmore Hill and Hazlemere. On 14 October 1887 he purchased seven cottages (Nos 1-7 The Row) in Winchmore Hill from George Charsley and Rebeckah Banks. On 13 October 1913 he purchased Nos 70 and 71 Winchmore Hill together with a plot of land at the bottom of The Hill from the estate of George Weller deceased, and had ‘Holly Cottage’ and ‘Holly Villa’ built on the land. In 1934 or 1935 he had three further houses built on the land – ‘Kingsbury’ (into which his son William moved), ‘Homestead’, and ‘The Bottom’. These three houses were built by Arthur Pursey, son of Thomas and Emma. The total of 14 houses in Winchmore Hill were left in his will to his son William. In Hazlemere Joseph purchased all the houses on the left hand side of Green Street, and all but one of the houses in Grove Road. Apart from ‘Leylands’, all this property must have been disposed of before his death, either sold or assigned to trustees for the income to go to his daughter Henrietta. (See the section on Joseph’s will.) For some reason in 1935 Joseph mortgaged four properties in Winchmore Hill, (‘Homestead’, ‘The Bottom’, ‘Holly Cottage’ and ‘Holly Villa’) to the High Wycombe and South Bucks Building Society for the sum of £500. The mortgage was repaid in 1937. The tenants at the time were Mrs Meeks, Mrs Sears, J Bryant and A Francis. Joseph Hatch was a stern man with a reputation for being tightfisted, and he was still remembered locally at the end of the 20th century. He was famous for driving a horse and trap to Amersham and Wycombe stations, white beard flowing in the breeze. This beard was once caught in a lathe and a chunk of his skin was torn off. Once, when suffering from toothache, he wedged his mouth open with a chair-stretcher, placed a chair-spindle against the tooth, and ordered one of his workers to knock out the tooth with a mallet. When the worker demurred, Joe threatened to sack him. John Deacon remembers that as a child he used to join with other children in hiding in the hedgerows and throwing stones at Joseph as he drove his horse and four-wheeled cart to Wycombe – Joe used to lash out at them with his whip. John Deacon also remembers that Joe had a contract with the council for supplying stones (presumably flints from his fields) for surfacing the Amersham-Wycombe road. In 1913 there was a lock-out by chairmaking employers in High Wycombe when their workers were demanding higher wages. A deputation was sent to Joe to try to persuade him to join the lock-out, but he refused. Emma Pursey, widow of Thomas and landlady of The Plough from 1919 to 1936 recounted hearing Joe’s workers discussing him in the bar – “That Joe ‘atch ‘e may be ‘ard but ‘e be a just bugger!” Although stern, he had a lighter side. He was very fond of his daughter-in-law Kate (née Pursey), and when she stayed at the farm brought her breakfast in bed, much to her mother Emma’s amazement. At family Christmases at Woodrow Farm he used dress up in a rug with a horse’s head, and with one grandchild on his back, chase the others.. He was very musical, and taught himself to play the violin, which he played at Winchmore Hill Wesleyan Chapel. When Joe retired and moved to ‘Leylands’ in Hazlemere he was not happy, and referred to the house as “my prison”, and his daughter Hetty said that he used to pace up and down the garden. No mention is made in the will of any of his daughters except Henrietta (no doubt he assumed that if married they were provided for), nor of his son Joseph David (Fred had died in 1938). As the chair factory was run by Joseph David during the 1920s and 30s, it would seem that he passed the business to him before his death. In any case the land on which the factory stood was probably owned by the Shardeloes estate and leased to the Hatchs. A slightly different account of Joseph’s will was given by the daughters of his youngest son William. They remembered a big furore when the will was read. All his surviving children except Mary, Elsie and Elizabeth were left £500 each (those three received nothing because Joseph had helped their husbands set up businesses on heir marriage). Laura had died in 1942, and nothing was left to her family. In addition to the £500, Joseph and Frederick inherited the factory. Joseph David Hatch 1874-1962 married 1903 Kate Pursey 1875-1969. Joseph was admitted to Woodrow School on 24 June 1878, and in 1881 he was, age 6, living with his parents at Whielden Gate, a ‘scholar’. In 1891 he was living with them in Winchmore Hill, age 16 and described as a ‘farmer’s son, neither employer nor employed’ which suggests that he was working with his father, perhaps both in the chair-making and farming enterprises. He left school at the age of 11 and was known to have accompanied one of his father’s workers delivering chairs to London (and further afield – he recounted going to Manchester and to the south coast by horse and van ). He moved with his parents to Woodrow farm sometime around 1894, and was there in 1901 when he was described as a ‘worker’. He married Kate Pursey, eldest daughter of Thomas and Emma Pursey of the Plough Inn, Winchmore Hill on 4 August 1903. The early years of Joseph and Kate’s marriage were spent in the then recently built ‘Hope Cottage’ opposite the Railway Hotel near Amersham station. It was at Hope Cottage where their daughters and were born (1904 and 1906). Joseph moved here because his main role in the chair-making company at the time was to obtain orders in London: he travelled there by train every Tuesday, Wednesday and Friday until the firm purchased a lorry. During this period he was in the Buckinghamshire Yeomanry, and a photograph shows him in Yeomanry uniform, seated on a horse outside ‘Hope Cottage’. In the early 1920’s, Joseph purchased two old cottages located next to the Red Lion and opposite the church from Miss Bowden of High Wycombe. He converted these into a single dwelling that he called ‘Moorwood.’ The two cottages had sitting tenants (the Appleby and Shrimpton families): one of these families had nowhere to move to, so Joseph accommodated them with his family at Clivia Villas to allow conversion work at the cottages to begin. The Hatch family moved into ‘Moorwood’ in 1924. The Hatch chair factory. Joseph David worked at the Whielden Gate factory in partnership with his father and his brothers Frederick, Archer and William. The company was called ‘J.Hatch and Sons’. Joseph David’s role was mainly obtaining orders and delivering finished chairs. Fred did most of the office work but was also in charge of spraying logs with preservative, Archer divided his time between helping in the factory and working on his father’s farm, William worked in the factory and was responsible for its security. The factory was not fenced off, and all its timber was stored by the roadside – not just by the works, but on either side of the Wycombe road where it curved past the Queens Head. Some 30 to 40 men worked at the factory at the peak of its production, and in addition the company employed outworkers in the surrounding villages as far away as Speen. Joseph David delivered wood and cane to the villages for turning and caning. Local people used to visit the factory to collect woodcuttings, firewood and sawdust. The factory was lit by oil lamps which must have been a considerable fire risk. At some point, probably in the 1930s, old Joseph passed the business to Joseph David and to Fred, though the latter died in 1938. Joseph David delivered chairs to London by lorry throughout the 1920s and 1930s. He never worked less than a 12 hour day starting at 7am, and in the summer used to work in his garden after arriving home – the family were self-sufficient in vegetables. The business evidently continued to prosper, as Joseph David invested money in property in Chesham. The family were relatively well off compared to most in Coleshill: Joseph owned a motorbike and side-car in the 1920s (in which he used to drive the family to Brighton in two relays) and a car by the 1930s. He was the first person in the village to own a car apart from Mr Forbes who lived at the Manor House near the Beaconsfield Road. Joseph, as an independent man, was able to challenge Forbes’s arrogant snobbery, unlike most in Coleshill. In 1936 Joseph David sold ‘Moorwood’ and moved to a house at the bottom of First Avenue (No 17 Station Road, Amersham) which he also named ‘Moorwood’. The move was prompted by his daughter Edith’s having taken up employment in the office of Robin Brazil, builder, and Joe did not care for her having to walk there from Coleshill. With the death of Fred and the onset of the Second World War, Joseph was increasingly left to manage and market the firm single-handedly, and he sold the factory to the Dunmore Brothers of Amersham Common who utilised the site as a timber yard. (It is not clear whether the sale was made at the start or the end of the war). He continued to work part time as a furniture maker at a firm in Gerrards Cross until well into his eighties. After suffering a series of strokes he died at Moorwood, Amersham, in 1962. Joseph and Kate’s ashes are interred in the grave of their son Ronald in Penn Street churchyard, but the site of the grave is unknown.